Sweet, refreshing, and slightly tart, this Lilac Lemon Drop Martini is a perfect spring cocktail and it is very easy to make. The recipe is a variation of the popular Lemon Drop Martini, it simply brings a bright floral flavor into the vodka martini. The key to this drink is the easy to make lilac simple syrup. It's a great way to add the sweet fragrance and flavor of lilacs into a variety of drinks. Lilacs only bloom in spring, so this is a very seasonal recipe. It is one that you will want to take full advantage of when those pretty purple blossoms make their annual appearance. Rim a cocktail glass with sugar. The Vodka. As with most vodka martinis, it's recommended to use a premium brand of vodka because this martini deserves a great vodka. After all, this is a once-a-year drink and if you go to the trouble of making the lilac syrup, you might as well do it up right. You may also want to try a flavored vodka for this cocktail. Any citrus vodka should work quite well and strawberry vodka may also be a good option. When playing with the lilac syrup I found that it pairs wonderfully with strawberries, so give it a try! The Lilacs. It's very likely that this may be your first taste of lilacs and you will be pleasantly surprised. The purple flower has a flavor similar to lavender, though it's a bit more floral like rose water. It's a fun and unique taste and will vary slightly based on the variety of lilac you choose to forage. The Lemon. The homemade syrup and premium vodka call for the best lemon juice you can buy and that comes directly from the fruit itself. For drinks like this with such a transparent flavor and simple ingredient list, taking the time to juice a few lemons will do wonders for the final taste. Before squeezing your lemons, cut a few lemon spirals for garnishes. Twist the spirals and store them in ice water in the refrigerator until your martini's ready. 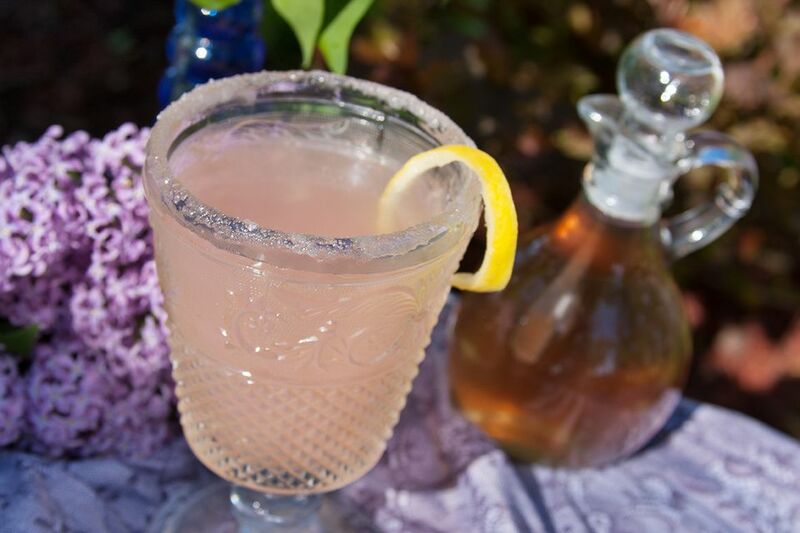 While you're at it, juice a few extra lemons and use the lilac syrup to make a floral homemade lemonade. It's fantastic and a spring delight the entire family can enjoy. How Strong is the Lilac Lemon Drop Martini? As far as vodka martinis go, the Lilac Lemon Drop Martini is average to below average when it comes to the alcohol content. This is because the shot of vodka is the only liquor, so the cocktail comes in around 18 percent ABV (36 proof).